The Bruery is a well known and highly rated Brewery out ofÂ Placentia, California that unfortunately does not distribute in Minnesota. 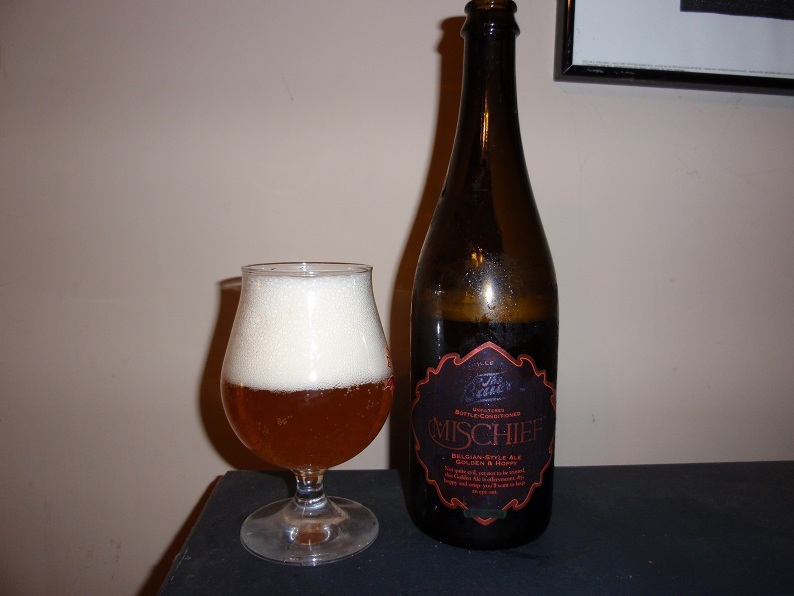 Luckily I was able to pick up a few bottles in Hudson including this bottle of Mischief, aÂ BelgianÂ Style Golden Strong Ale. The label states that this ale is “Not quite evil, yet not to be trusted, this Golden Ale is effervescent, dry, hoppy and crisp-you’ll wan’t to keep an eye out.” IÂ believeÂ I sampled something from The Bruery when I was at Dark Lord Day but that day was far too long to properlyÂ recall. So heres to my first proper enjoyment of one of their beers! Pours a bright completely translucent copper hue. Even when poured gently a massive bouquet of over four fingers of tight clean white bubbles are produced and fade over a few minutes leaving a solid fifth of an inch of carbonation indefinitely. Aroma is of lovely herbal and earthy yeast esters, clean lemon and orange hop notes, and soft malty sweetness. A variety of citrus flavors play with earthy and herbal yeast notes including gentle pepper which contrasts nicely with the fruity esters present particularly pear. As sweet grain compliments the surprisingly assertive hop bitterness in the finish. Mouthfeel is quite dry and the body is amazingly light. Even though this beer is a solid 8.5% ABV few will notice until after consuming an appropriate amount. Over all this is a solid interpretation of the style and is definitely worth trying. Particularly for those who enjoy the assertive, earthy and herbal yeast esters and don’t mind some decent bitterness and hop content to contrast with the enjoyable malty sweetness. A good substitution for a solid Saison when your looking for something with a bit higher of an ABV. Give it a shot and ride your bike.